Just as you were riding the high that was Simone Biles winning her fourth gold medal in the floor exercise on Aug. 16, you were hit with a dreadful realization — her final win means that Biles' time competing at the 2016 Rio Olympics is finished. Before you fall into a deep state of depression thinking how you won't see the 4-foot-8-inches queen of gymnastics dominate again this Olympics, I'm here to remind you that through the wonder that is the Internet (that thing you're using right now! ), you can watch Biles' last floor exercise over and over. Yes, NBC and the Olympics don't make it overly simple to access the video on all platforms, but still, knowing you can see the gold-winning performance again (or for the first time for you slackers out there) should make you as ecstatic as Biles was when she met Zac Efron. While her beginning moves and first pass aren't available through NBC's social media right now, the rest of her routine is. 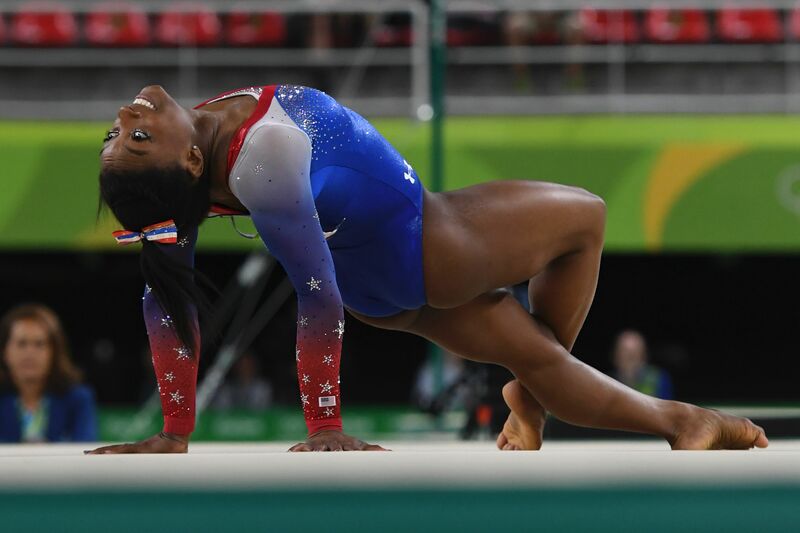 Her second pass features her signature move — the Biles — which is a double layout with a half twist. According to the USA Gymnastics website, she's only one of two women gymnasts to have a floor skill named after her and you can see it below in the clip of her final competitive performance at the 2016 Olympics. Then, jump to the below video to watch her third and fourth passes, plus her joyously bouncy ending. While she lost her balance a bit on the landing of her fourth and final pass, that didn't stop her from taking away the gold. Yes, that particular landing wasn't as strong as when she executed the pass for the individual all-around (where she did a little hop, but had tremendous height). Don't worry though, she still earned gold all three times she competed in the floor exercise and if you really want to see her nail that last landing, she was the most solid during the team all-around competition on Aug. 9 and in that moment, officially won Team USA the gold. Not only is it amazing how much Biles is able to pack into her 90-second floor exercise, it's also amazing how quickly her time competing at the Olympics has gone. Upon each viewing, her technical prowess, strength, and height only continue to impress and with the security of knowing that she has already won the gold, you can groove along like her teammate Laurie Hernandez during your rewatch. So get those body rolls going as you reexperience Biles encapsulating greatness during her final competition moment at the 2016 Rio Olympics.